New Star Wars casting rumors are damn near a daily thing here at GFR, and they range from the exciting to the downright stomach-churning. Still, nothing we’ve heard so far is quite so preposterous and yet simultaneously awesome notion of Jennifer Lawrence playing a young Han Solo in one of those spinoff movies Disney’s been talking about. Never tell her the odds. Everyone knows that once you go looking for something, you’re bound to find something that at least resembles what you’re looking for. The human mind works in weird ways like that. 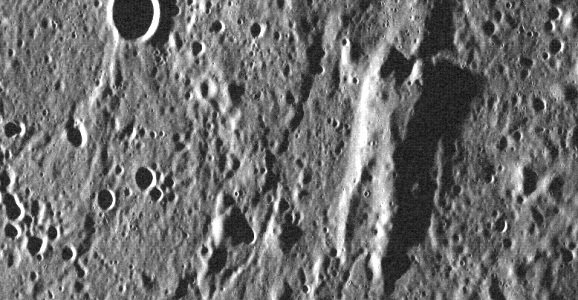 I’m not sure who went looking for Han Solo on the surface of Mercury, but I can tell you right now that he has definitely been found, no doubt about it, in an image taken by NASA’s Messenger probe back in 2011. The sighting of Solo himself happened only recently though, which may not bode well for our great hero. Okay, so it probably isn’t really a fictional Star Wars badass, and is almost definitely just a natural land formation, but the John Hopkins University Applied Physics Laboratory, who hosts the Messenger’s website, has a sense of humor about it. Harrison Ford and Comic-Con are not the old friends that some might suspect. In fact, when he appeared yesterday in San Diego, ostensibly to answer questions about Ender’s Game — which predictably turned into a bunch of Star Wars and Indiana Jones questions — it was only his second appearance. (First was Cowboys and Aliens. ’nuff said.) 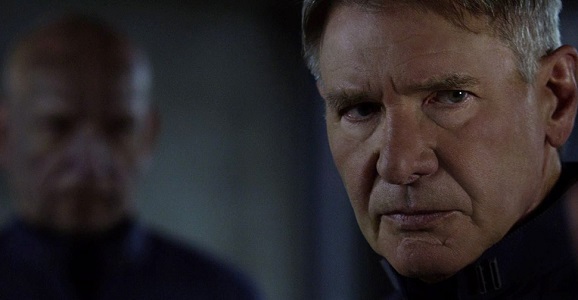 During the talk, Ford said that Han Solo wouldn’t have been a good fit for Colonel Graff’s army, and shared what brought him to the role in the first place. joked. “I used to dream about being Indiana Jones when I was younger. Not so much anymore. I don’t think Han Solo would be good as a soldier in anybody’s army. I think he’s what we call now an independent contractor.” I think the world of Star Wars and Léon: The Professional should come together, where Solo somehow saves Natalie Portman’s Padmé Amidala from her dysfunctional family. Might have a few time travel issues, but otherwise, it’s gold! Who could have thought back in the late 1990s that Singled Out host Chris Hardwick — because that reference can never die — would eventually become one of the top level proponents of geek culture, particularly the comedic side of it? In developing the Nerdist podcast, which quickly became the all-encompassing Nerdist Industries, Hardwick has often given science fiction a long, loving embrace. BBC America viewers know him from his guest-heavy Nerdist TV series and The Walking Dead fans definitely know him from his supplemental chat series The Talking Dead. Last year he added “charity” to his sci-fi repertoire by joining up with Lucas Entertainment, Machinma, and the sports agency Octagon for the “Course of the Force” event. If you can imagine, it just might be related to Star Wars. For the Star Wars fan who has everything — like this guy does — finding a present can be a chore. That’s assuming the “everything” that the Star Wars fan has includes kind-hearted friends. I admit I’ve given some thought over the years to alternate dimensions and parallel universes where things are similar how things are now, only with slight changes. And yes, I mostly envision a better life for myself, where regrettable errors went unmade and I didn’t have to drink tequila and bleach every night just to fall asleep. But I would definitely give up the good life just to witness Al Pacino as Han Solo in Star Wars. 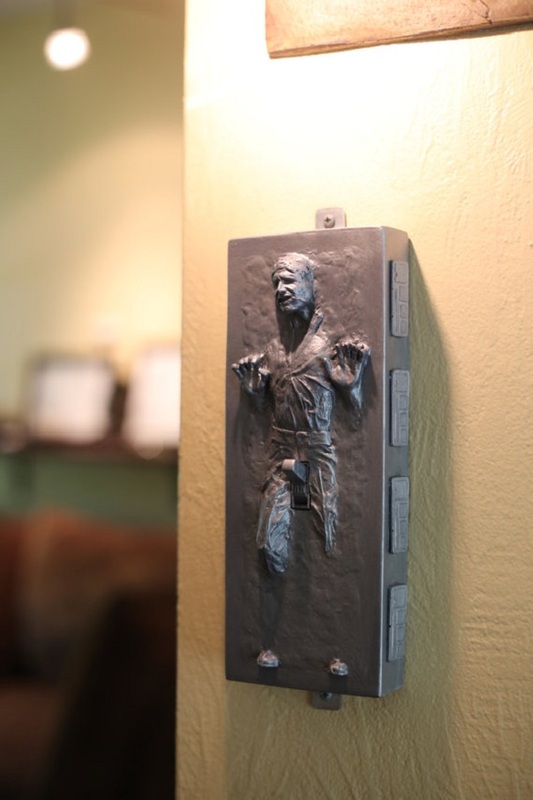 Seriously, even a bust of Pacino trapped in carbonite would be worth a minor life tragedy or two. Alas, Pacino as Solo just wasn’t meant to be, but not for a lack of trying on Lucas’ part. The legendary actor was being honored for “An Evening With Pacino,” an intimate interview with Emma Freud in front of a live audience at the London Palladium. Pacino was the wry, clever guy everybody wants to be friends with, and he shared some pretty juicy information about iconic roles that he ended up turning down, including the role of John McClane in Die Hard. Speaking about Bruce Willis, Pacino uttered some of the most confounding words ever spoken.